Sancho – San Jose, CA | Bull Terrier Rescue, Inc.
Sancho is a high energy 19 month guy who needs more activities than working parents with a toddler can give him. He is very social with dogs of all sizes but tend to annoy them with his exuberance to play. He does challenge the toddler so he’ll need a home with no or older children. Sancho likes to chase the cat that hangs around his front yard but we’re not sure what will happen if he ever caught up to it. This 65lb guy is crate, leash and obedience trained. If you’re looking for a happy, fun and active guy, Sancho is the one for you. If your information is not yet on file, please complete our online application: http\://www.bullterrierrescue.org/?page_id=572. 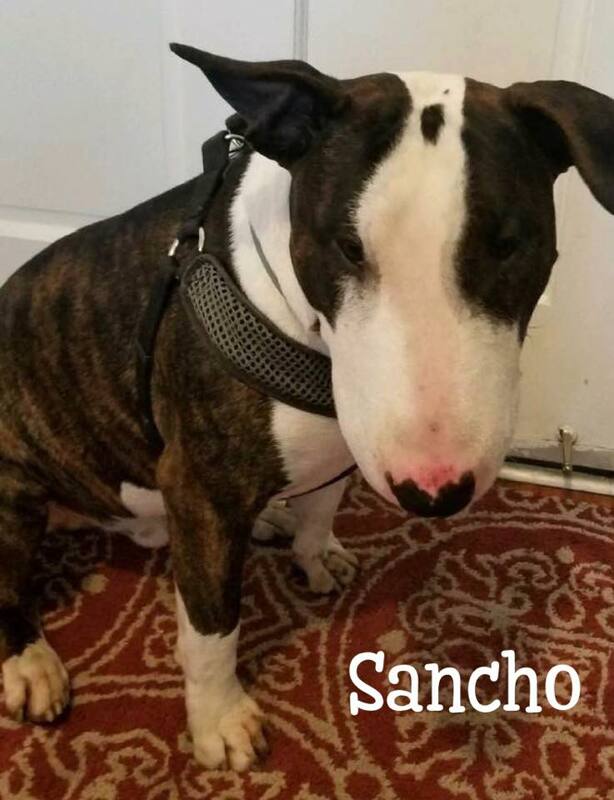 If you have any questions about Sancho, please contact Suz at suz@bullyhaven.org or 415-672-7391. Thanks! This entry was posted in Available Dogs, Available Dogs - No CA, Available Males, Dogs Needing Foster Homes by Susi Ming. Bookmark the permalink.